In 2013 millions of foreigners living or working in Saudi Arabia were ordered to regularise their legal status or leave the country. Below is a collection of my blog posts, in chronological order, documenting what happened. New posts will be added as the situation develops. Blog post 3 April 2013: The expulsion of thousands of expatriate workers from Saudi Arabia threatens to plunge Yemen into a new crisis. Last month, 18,000 Yemenis were reportedly sent home from the kingdom and deportations are said to be continuing at a rate of up to 2,000 a day. According to Yemeni officials, the total could eventually reach 200,000-300,000 – causing a loss of remittances and increased unemployment which will add to the country's economic woes. "Many Yemenis have circumvented Saudi sponsorship rules by paying one sponsor/employer while working for another or setting up their own independent businesses." This is not the first mass expulsion from the kingdom. More than 700,000 Yemenis were abruptly thrown out of Saudi Arabia in 1990, in what was seen as a punishment for Yemen's ambivalent attitute towards the Iraqi invasion of Kuwait. Meanwhile, Yemen is in the process of expelling migrants from East Africa – mainly Ehtiopians – who have entered the country illegally. The Yemen Times says 2,500 have been deported so far this year. "In Haradh town, which the migrants see as a gateway to Saudi Arabia and beyond, thousands of migrants roam the streets and sleep rough in the open with no money for food or medicine," Jumbe said. "Many migrants visiting IOM's offices have been rescued from unscrupulous gangs of kidnappers, traffickers and smugglers and are injured, some with broken limbs. Criminal gangs are also reportedly trading in human organs," he added. In addition, the hospital mortuary in the northern Yemen town of Haradh is now filled with the unclaimed bodies of migrants, he said. Blog post 4 April 2013: Saudi Arabia has expelled more than three-quarters of a million "illegal" foreign workers during the last 15 months, according to a spokesman for the passports department in Riyadh. Last year, 575,000 were deported, followed by a further 200,000 during the first three months of this year. Inspectors are going round the country, raiding places where they suspect illegal workers are employed, the Labour Ministry says. "Saudi Arabia made job creation a priority after popular unrest toppled leaders across the Middle East starting in 2011. King Abdullah, who turns 89 this year, unveiled a $130 billion stimulus plan in 2011 to create jobs and tightened rules on the expatriate workers most businesses depend on. "The aim was to ensure that the world’s biggest oil exporter remains unscathed by the unrest that has swept other Arab countries with high unemployment. With about a quarter of Saudis aged 20 to 30 out of work, the government in 2011 curbed the number of work permits issued to foreigners, linking them to the number of Saudis a company employees. "In addition, deportations began ..."
Saudi Arabia has about 9.4 million foreign workers, many of whom are working illegally as a result of the onerous and corrupt sponsorship system. "Saudisation" – replacing foreign workers with Saudis has long been government policy – though Saudis are generally reluctant to take on the traditional migrant-worker jobs such as street sweeping, construction work, shopkeeping and taxi driving. In the past, efforts to implement the policy have usually been half-hearted and the mass expulsions appear to be a recent development. This will also have a knock-on effect for several other countries, since Saudi Arabia is the world's third-biggest provider of worker remittances. In 2011, these accounted for 6.2% of Egypt's GDP, 10.3% of the Philippines' GDP and 4.2% of Yemen's GDP, according to the World Bank. Currently, up to 2,000 Yemenis are being deported from Saudi Arabia every day (see yesterday's blog post) and Yemen's government has sent a high-level delegation to Riyadh to discuss the situation. "Since Saudi Arabia is home to the largest Yemeni labour force, and since Yemen is a member of the Labour Office of the GCC, and in view of our brotherly relationship, our geographical proximity and the current political situation in Yemen, we ask the Saudi government to grant a waiver to Yemeni workers." Blaming foreigners for a country's economic problems is a familiar tactic all over the world, and the "send them home" policy adopted by Saudi Arabia is what racist and anti-immigration movements in the west also advocate. But it has not gone unchallenged within the kingdom. "In our country, however, the foreign manpower is portrayed as the main barrier impeding the employment of Saudi nationals. Because of our 'specialty', arrogance and our excessive sensitivity toward strangers, the foreigners living in this country have become isolated from society. "The complex procedures of imposing the process of Saudisation on small companies has encouraged the workers and owners of these small establishments to go around the regulations of the Labour Ministry. "This is the naked truth. The fault is within us and not within the foreign workers. The owner of the company that employs foreigners and refuses to employ Saudis is himself a Saudi and not a foreigner. Why then do we direct our negative sentiments in the reverse direction? When will we understand that the expatriates are our partners in building this nation and are not responsible for any of our failures or disappointments?" Yesterday, Ameera Ahmed posted a series of photos on Facebook which she says were taken in a Saudi jail by a Yemeni relative awaiting deportation (see above and below). Blog post 5 April 2013: Amid growing controversy over the mass expulsion of foreign workers from Saudi Arabia, Arab News reports that the governor of Riyadh, Prince Khaled bin Bandar, has extended the "Saudisation" deadline for businesses by two months. The paper says Prince Khaled's move has been welcomed by "Saudis and expatriates alike", and the governors of other regions are likely to follow suit. However, there are signs of disagreement among different branches of officialdom. Arab News also notes that a spokesman for the Labour Ministry – which is at the forefront of the campaign to expel "illegal" foreigners – claimed to be unaware of the prince's decision, except through media reports. The "Saudisation" programme is meant to reduced unemployment – especially among young people – by compelling businesses to employ more Saudi citizens but Arab News says "the nationwide campaign has hit businesses and created a kind of fear among expatriates". This has led to the targeting and deportation of thousands of foreigners deemed to be working in the kingdom illegally (largely as a result of corruption in the process of granting permits). Almost 800,000 have been expelled during the last 15 months, according to Saudi officials. "Many foreigners have come to the kingdom purchasing visas offered by Saudi sponsors, paying thousands of riyals. They would not have purchased such visas if they knew they would be considered illegals." Another problem with the policy is that Saudis – even if they are unemployed – are unlikely to take up the menial kind of jobs being vacated by many of the expelled foreigners. Building workers are one example and, as a columnist in al-Yaum newspaper pointed out, "Thousands of Saudis are in the process of building their own houses and they depend mainly on foreigners." "With most of the teachers coming from abroad, the schools have found themselves without staff as employees remain at home in order to evade the net of arrests and deportations. Many small businesses have also reportedly been staying shut for the same reason." The BBC adds that there have been protests outside the Saudi embassy in Yemen (one of the countries most affected by the expulsions). Some 30 Filipinos were arrested in Jeddah this week during the crackdown on illegal workers and employers, according to the Philippines Department of Foreign Affairs. The Asia Pacific Mission for Migrants called on the Saudi government to halt its crackdown and instead "address why migrant workers become undocumented". "Many people are refusing to step out of their homes as coordinated raids are being conducted on the streets and at offices. Local newspapers have reported that many community schools run by Indians have also been shut for a few days on account of the raids," said Faiyaz Sharief, a hospital employee who lives in Jeddah but hails from the city. Images and videos of the raids floating on the internet, which show migrants in deplorable conditions trying to evade the authorities, have also fuelled the panic. The paper also says 2,000 Indians have approached their embassy in Riyadh during a two-day period this week, seeking Emergency Certificates to return to their homeland. The Economic Times quotes Vayalar Ravi, the Overseas Indian Affairs Minister, as saying: "We have decided to provide air tickets to deserving people who want to come back from the country. I have asked the ambassador to extend all possible help to our citizens affected by the law." "Several men then start kicking one of the immigrants, despite pleas by several people, including the person filming the scene, to stop. A person wearing camouflage fatigues – presumably a member of Saudi security forces – appears towards the end of the video, seemingly trying to disperse the crowd assaulting the immigrant." Al-Akhbar provides a link to the video, though attempts to access it this morning resulted in a message saying "This video is private". Blog post 2 June 2013: At the beginning of April chaos and alarm swept through Saudi Arabia as inspectors raided businesses that were thought to be employing foreigners illegally. Thousands were deported, often ignominiously (see earlier blog posts here and here). The campaign – driven mainly by the Labour Ministry – was aimed at implementing the kingdom's long-standing "Saudisation" plan in which jobs previously done by foreigners will supposedly be filled by unemployed Saudis (even though many of the jobs are of a type that Saudis wouldn't dream of taking). Amid a welter of criticism – not only about the heartless way the authorities set about implementing the plan but also from foreign embassies and employers whose businesses were put in jeopardy – the king stepped in and called a temporary halt. A royal decree set a new deadline of July 3 for "illegal" workers to regularise their position. "If they go to the Labour Ministry, the ministry sends them to the Passport Department, while some are told to visit their missions [embassies] first to get a paper or to get papers authenticated, which is a drain on their pockets. "In addition, in some cases sponsors demand money from expatriates for an NoC [No Objection Certificate] or to get their documents back, even though the government has emphasised that such services are for free." "Since we are responsible, either directly or indirectly for creating this mess, then we should facilitate all procedures to help correct the situation. "Rectifying the status of expatriate workers is the least we can do as an apology to all expatriates who have been treated badly by some Saudi sponsors and some companies." Today, Arab News reports that the authorities are once again under pressure from embassies and employers to extend the deadline, though the Labour Ministry appears set against it and says any further extension would have to come from the king himself. Even Saudis seem baffled by parts of this list, but Arab News says basically it is "related to human resources, customer services, health management, accounts, clearing and forwarding agents and, of course, women-sensitive sales areas". Employers also appear sceptical about implementation. The paper quotes one employer as saying: I think the best way to implement Saudisation is not through passing legislation but through the sincere and active participation of the private sector and expatriates. The Labour Ministry should seek the help of expatriates to train Saudis to replace them." Arab News adds: "Hiring extra Saudis and putting them on the payroll will throw many private companies out of business, as it will take at least three to five years to train and replace the expatriate work force, especially at the lower and mid levels." This is rapidly turning into an object lesson in how not to manage change. Ultimately, it boils down to the Saudi preference for issuing decrees from on high rather than allowing open and transparent government. It's only through widespread public debate about policies and their implementation that problems can be identified and addressed – before rather than after they actually arise. Blog post 4 November 2013: An "all-out campaign" to round up and expel foreigners who are living or working illegally in Saudi Arabia is getting under way today. There is no set time limit for the campaign and raids "will cover all cities, towns, regions and villages as well as highways across the kingdom", according to the Saudi Gazette. "All expatriates who work for their personal gain or overstayed their Hajj, Umrah, and visit visas and infiltrators will be caught and will be detained until completing legal procedures for penal measures and deportation," interior ministry spokesman Mansour al-Turki told a news conference yesterday. He added that the campaign will also target Saudis who employ or assist illegal residents: "Those who cover up illegals or those who give them shelter or transportation or any kind of help will also be apprehended." "Many Yemenis [and others] have circumvented Saudi sponsorship rules by paying one sponsor/employer while working for another or setting up their own independent businesses." Saudi Arabia is thought to have more than nine million foreign workers, many of whom are working illegally as a result of the onerous and corrupt sponsorship system. "Saudisation" – replacing foreign workers with Saudis – has long been government policy though Saudis are generally reluctant to take on the traditional migrant-worker jobs such as street sweeping, construction work, shopkeeping and taxi driving. Saudisation has also been resisted by employers in the kingdom who claim it will deplete their workforce and perhaps even put them out of business. Last year, according to official figures, Saudi Arabia deported 575,000 "illegal" workers, with a further 200,000 deportations in the first three months of this year. The latest effort, aimed at ridding the kingdom entirely of "illegal" foreigners, is viewed as an attempt to protect the regime from the effects of the Arab Spring by reducing unemployment among young Saudis. The authorities stepped up their expulsions last March, and at one point 2,000 Yemenis were reportedly being expelled every day. The result was chaos and panic as thousands of foreigners – especially Indians and Filipinos – sought to regularise their status or obtain exit visas. A number of private schools were forced to close as foreign teachers stayed away, fearing arrest. There were also reports of undocumented foreigners being physically attacked by vigilantes. Amid a welter of criticism – not only about the heartless way the authorities set about implementing the plan but also from foreign embassies and employers whose businesses were put in jeopardy – the king then stepped in and called a temporary halt. Initially the king declared a three-month grace period for foreigners to regularise their position but that was later extended for a total of seven months – ending yesterday. The delay has also given the authorities some time to think about how the plan will be implemented, and how to head off some of the expected criticisms. Yesterday, officials insisted that inspection raids will be carried out by "highly professional teams", there will be no "random raids", inspectors have been trained to behave "in a highly civilised manner", private homes will not be raided and inspectors will not ask questions which have "a negative impact" on businesses. Even so, there are signs that local media are unlikely to give the authorities an easy time. An article in today's Arab News, headed "Expats worried sick as amnesty ends", says labour shortages are already being felt as expatriates leave the country or go into hiding. A factory manager in Jeddah is quoted as saying production has been affected and "our clients fail to understand why delivery times have become longer". "The caretaker of a building in the Faisaliyah district told Arab News that he is so scared that he has not been able to eat, drink or sleep for the last few weeks even though his application for an iqama [permit] is pending. "He said he was told to report to the Passport Department office on Sunday but that the person in charge was not present. 'I am scared because I would have to leave before November 4 if I don't get an iqama. I have already paid SR4,000 and submitted my paperwork,' he sobbed. "The man arrived in the kingdom nearly 10 years ago to work on a farm in a small village, but the work was difficult and the sponsor did not pay for months on end. So he ran away and came to Jeddah." "Egyptian national Ahmad Ibrahim said he came to the country to perform Umrah after which he did not go back and remained here to look for a job. He went to Jeddah to stay with some of his friends and worked as a painter. Whenever his wife asked him about his job, he told her that he was a manager, as he did not want to lose her trust in him. "Mohammad Fawwaz, another Egyptian who came to the Kingdom to perform Umrah and overstayed, said he has a commerce degree but no companies would hire him as he did not hold an iqama or residency permit. "Fawwaz said as he could not legally work, he learned to be a barber, which has provided him with a decent income. He also used to lie to his family, telling them he worked as an accountant in a large company and whenever he received visitors from Egypt he would take a few days off work until they leave." Although the principle of Saudisation seems to be widely accepted, the Saudi Gazette says business opinion is "almost equally divided" over whether it should be implemented more slowly. Because of the popular uprisings elsewhere in the region, the Saudi authorities are now treating Saudisation as a matter of some urgency but it is doubtful whether there can be a quick solution. The problem of illegal expatriates has been allowed to develop over many years and, according to Mahmoud Ahmad in an article for Arab News last May, it's a problem of the Saudis' own making. If the Labour Ministry had been more willing in the past to give expatriates a chance to rectify their status, or if it had been tough on abusive sponsors, the number of foreigners without proper paperwork would have been much smaller than it is now, he said. 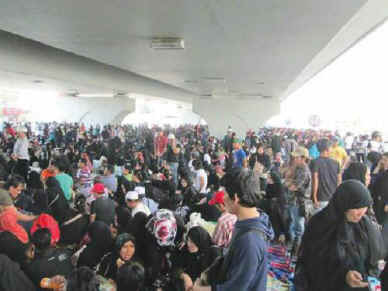 Undocumented Indonesian workers gathering under a bridge in Jeddah on Sunday. Blog post 5 November 2013: The Saudi authorities must have been delighted to see John Kerry, the US secretary of state, paying a schmooze visit to the king on Monday. This gave the western media something to talk about and diverted attention from the big story of the day – the start of the kingdom's "all-out" campaign to get rid of "illegal" foreigners. The crackdown, in the words of Jeddah's police chief, has got off to "a vigorous start". Inspection squads rounded up almost 5,000 men and women yesterday, according to preliminary figures from the authorities – 2,200 in Samta and 1,899 in Jeddah, with smaller numbers in the Eastern Province, Baha, Tabuk, Yanbu, and Hafar al-Batin. Arab News says 300 were also detained in Madina for violating residency laws. Aside from the mass arrests, the main effect of Day One was to demonstrate in very visible terms how heavily Saudi Arabia depends on foreign labour. As undocumented workers leave or go into hiding, some sections of the economy have ground almost to a halt. "For perhaps the first time in its history, the 'Halaqa' central vegetable market had virtually no workers on the scene. This, coupled with a fall in vegetable supplies from abroad, has gravely affected market activity. "Indeed, supplies of fresh produce to Jeddah [have] been badly hit, resulting in spiralling fruit and vegetable prices. Potatoes, which were being sold at SR4 per kg as of Sunday, doubled on Monday to reach SR8 a kilo. "Traders said there were no supplies from Hail, where labourers stopped reporting to farms to pick and load potatoes. "The meat market was also affected badly, with Sudanese shepherds not turning up at work in east Jeddah…"
Construction work in Jeddah was also badly hit. Sales of cement and ready-mixed concrete – a good measure of the level of activity – would be around 4,000 cubic metres on a normal day but fell to just 600 cubic metres on Monday, Arab News says. The Saudi Gazette reports that many bakeries in Madinah, Jeddah and Makkah – often a source of employment for undocumented foreigners – were also forced to close and Adnan Fakeeh, a member of the National Committee for Bakeries, warned that up to a quarter of them could go permanently out of business. There are "hardly any Saudis" willing to take up bakery jobs vacated by foreigners, according to the committee's chairman. This could lead to the spread of unlicensed bakeries which do not meet health regulations, he said. The Saudi authorities, acutely aware of the controversy this campaign is arousing, announced a couple of minor concessions yesterday. One, which will no doubt help to placate religious elements, is that undocumented foreigners who work part-time teaching memorisation of the Qur'an should not be arrested or fined for violating the new labour laws. The ministry of labour has also said it will not carry out inspection raids on schools for the remainder of this term. Most fee-paying schools in Jeddah were reportedly closed on Monday as they attempted to regularise the employment status of teachers. "Saudisation" – replacing foreign workers with Saudis – has long been government policy and the current crackdown is an attempt to unpick years of maladministration and corruption which resulted in vast numbers of expatriates working in the kingdom illegally. The crackdown is also viewed as an attempt by the Saudi regime to protect itself from the effects of the Arab Spring by reducing unemployment among young Saudis. The Saudi unemployment rate is officially put at 12% – though Reuters notes that this figure "excludes a large number of citizens who say they are not seeking a job". Persuading Saudis to swallow their pride and take up work previously done by Asian and Filipino expatriates will not be an easy task, though Arab News reported one small glimmer of hope today: fifteen young Saudis are to join a training scheme in the hospitality business which has been organised by a hotel chain. It is not only in Saudi Arabia that the campaign's impact is being felt. Countless families around the world, especially in some of the poorer countries, have been depending on remittances from undocumented workers in the kingdom – workers who now face expulsion if they are unable to legalise their status. "They treated us like animals," said domestic helper Amor Roxas, 46, who burst in tears while narrating her ordeal. She claimed Saudi police rounded them up and placed them in a crowded cell for four days before they were paraded from the immigration center to the airport. "Our feet were chained," added Yvonne Montefeo, 32, in between sobs. Saudi Arabian embassy officials in Manila did not want to comment on the allegation of abuse. Migrante International, a support group for Filipino overseas workers, warned that the Filipinos "are in danger of being violently dispersed, arrested and detained by Saudi authorities" as the kingdom implements its crackdown, AFP added. 1.27 million Filipino workers in Saudi Arabia, of whom 108,000 were undocumented. More than 4,000 are said to have been repatriated since the crackdown was announced and a further 1,700 are awaiting exit papers. By last month, more than 700,000 Pakistanis had succeeded in regularising their status, either by changing their profession or changing their Saudi sponsor, according to Muhammad Naeem Khan, the Pakistani ambassador in Riyadh. He expects this figure to rise above 800,000. It is unclear how many still lack proper documentation. In 2004, Pakistan's labour ministry estimated there were 1.5 million Pakistanis in Saudi Arabia. "You see now every expatriate guest worker shall have a proper contract; they will have jobs according to their profession; they will enjoy their legal status as they will now have medical insurance; they will be able to go out and return to the kingdom without any hassle, and above all they will not have any fear of being illegal here. I am sure this will yield positive dividends for expatriate guest workers." About 1.7 million Indians are thought to be working in Saudi Arabia – half of them from the state of Kerala. India's Financial Express says 466,689 have renewed their residence permits during the last five months, 359,997 workers have transferred their sponsorships and 355,035 workers changed their job titles to legalise their status. The Indian government had given assurances to Saudi Arabia that no illegal Indian workers would remain in the kingdom after the November 3 deadline, Financial Express says. By the end of October a further 90,000 Indians were said to have returned home from Saudi Arabia but One India News reports that 3,000 illegal expatriates from Kerala are still stranded in the kingdom. Blog post 6 November 2013: Thousands more foreigners were arrested in Saudi Arabia on Tuesday – Day Two of the kingdom's "all-out" campaign to get rid of undocumented expatriate workers. "Officials of labour and interior ministries said they recorded arrests in Makkah, Madinah, Riyadh, Taif, Hail, Jazan, Qassim, Najran and Asir. 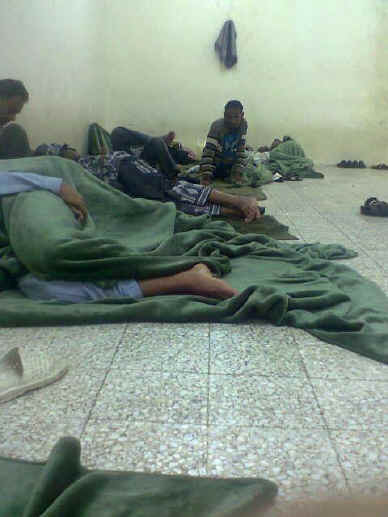 "In Jazan alone, law enforcing agencies arrested more than 8,000 illegal expats and deported 3,000 illegals to Yemen over a 24-hour period, according to Frontier Guard sources. "Special Forces for Road Safety and the Department of Criminal Investigation in Madinah took about 720 illegals into custody, according to Madinah police chief Maj. Gen. Saud bin Awad al-Ahmadi." On the first day of the campaign about 5,000 men and women were rounded up, according to the authorities. The Saudi Gazette describes the extraordinary impact this is having on everyday life in the kingdom as expatriate workers who have been unable to regularise their status are deported en masse and others go into hiding. In Jazan province, next to the Yemeni border, about 60% of commercial shops, workshops, fruit and vegetable stalls were closed, the paper says. "Markets wore a deserted look, many commercial establishments and hospitals reported no-shows, shutters were down on many grocery stores and eateries, street vendors were nowhere to be seen. Customers were forced to fill grocery bags themselves at supermarket counters in the absence of expat workers who did this job. A Saudi national in Jeddah summed up the scenario: "It seems that the country was full of violators. Shops are closed, streets are empty, restaurants are empty. I counted 30 cell phone shops on one street closed. God help us! Where are the citizens?" In Jazan, a number of Saudis said that they had to go to their workplaces, wearing un-ironed thobe and headgear (shemagh) as most of the laundries remained closed. "There was no way for me to wear a washed and ironed thobe and shemagh as I saw doors of the laundry where I deposited my clothes closed without any notice," said Muhammad Qassem. Even the dead had to suffer. About 13 facilities for washing dead bodies were shut down in Jeddah due to the absence of workers. Those who wash dead bodies at these facilities are part-time workers who are scared of inspection raids. Some expatriates who do have legal status in the kingdom are also worried about falling foul of the strict sponsorship rules. "Even legal workers are afraid to show up at the work site," a man who is having a new house built told Arab News. He said a subcontracted painter who is working legally for his sponsor’s paint shop didn’t turn up for fear of being caught working in a place other than his sponsor’s shop. Saudis who employ undocumented workers face heavy fines and will also have to pay the deportation costs. Self-employed expatriates are required to pay for their own deportation, Arab News says. The mistreatment of foreign workers by some individuals in our society comes without any respect or realisation for the status of these societies' deep-rooted accomplishments in history and culture. This view of superiority has affected the methods we raise our children, as well as social upbringing in our societies. We then complain about workers escaping from our firms and homes. Yesterday interior ministry spokesman Mansour al-Turki questioned the authenticity of one of the videos which has been widely viewed on YouTube. It appears to show a migrant worker being beaten by a Saudi man. Turki told CNN: "Nobody has actually reported this incident to the police yet ... and nobody has come to police claiming to be a victim of the abuse." According to the Indian embassy, 134,281 Indians have now left Saudi Arabia and 1.4 million have regularised their status. The embassy added that there are currently more than 2.8 million Indians in the kingdom (this is far more than the 1.7 million estimate that I quoted in my blog post yesterday). Blog post 7 November 2013: Wednesday – Day Three of Saudi Arabia's "all-out" crackdown on "illegal" migrant workers – brought news of the first death. Riyadh's police chief said an Ethiopian man had been killed in el-Manfouha, a poor district of the capital, when he and others tried to resist arrest. Riyadh police, apparently happy to stir up prejudice against the migrants, claimed that "some" of the 818 rounded up in the capital on Tuesday "were drunk or in possession of light weapons". According to the latest official figures, 16,487 "illegal" workers were arrested across seven provinces in the first two days of what some of the Saudi newspapers are euphemistically calling a "correction" process. Arab News says a further 11,756 "violators of residency and labour laws" were arrested yesterday. If the official figures are accurate, this brings the total number of arrests over a three-day period to 28,243. Even by the standards of Middle Eastern dictators this is an extraordinary number – and yet the story is getting only minimal coverage in international media and has so far aroused little interest on Twitter. The crackdown is intended to put an end to years of mismanagement and corruption in the kingdom's sponsorship system for migrant workers. Previously many of these workers signed contracts with sponsors, often for very low salaries and supplemented their incomes by working for other employers. Many also became "illegal" after falling out with their original sponsor-employers. Others, having arrived in the kingdom for pilgrimages, overstayed and took up work without permits. A change in the labour law now requires them to have a single employer, with their profession recorded on the visa. Anyone found working for another employer is liable to be deported. Saudis who employ migrants illegally can be fined up to SR100,000 ($26,600) and jailed for up to two years. Today's Saudi Gazette puts a positive spin on this, quoting an economist who says the changes will benefit the economy – reducing inflation, easing unemployment, creating investment opportunities, etc, etc. The economist, Fadl al-Buainain, claims there were 10 million expatriates in the labour market "who prevented Saudis from getting jobs", though he also says "illegal expatriates were only marginal manpower that had no effect whatsoever on the market". Buainain goes on to say that migrants were "a burden on the economy" because they took advantage of subsidised services and goods, adding: "Riyadh was suffering from a scarcity of water and energy because of the steady demand for these resources by the large number of foreigners." Similar arguments have been heard many times before, from racist and anti-immigrant movements all over the world. The reality, though, is that most of the migrants have not been depriving Saudis of jobs, nor has their role been marginal. They may exist on the margins but they provide services that are often essential. Numerous sectors of the economy have been hit in the crackdown as migrant workers leave or go into hiding. Shops, restaurants and even schools have had to close and construction sites have been abandoned (see Tuesday's blog post). Yesterday it was reported that there is now a shortage of people in Jeddah to wash the bodies of the dead before burial. Today, the Saudi Gazette reports problems with water deliveries by tanker – 60% of the drivers in Jeddah have gone missing – while Arab News reports similar problems with liquid propane deliveries. Arab News also describes a raid on Jeddah's central vegetable market (Halaga) yesterday by two busloads of inspectors who detained "dozens" of Yemenis and Pakistanis. "The raids have had a direct impact on area markets, which have raised produce prices by as much as 100 percent," the paper says. "Farmers in Jazan, Baha, Taif and Asir also reported raids, which in turn have affected the flow of supplies to markets." The idea that thousands of young Saudis supposedly deprived of jobs by undocumented migrant workers will now be rushing to fill the vacancies for washing the dead, shifting vegetables, labouring on building sites and other tasks that they regard as menial or degrading is, at best, fanciful. An article in Al-Madinah (translated into English by the Saudi Gazette) highlights the shattered expectations of those who study abroad under King Abdullah's scholarship scheme – only to find there is no suitable work for them when they return. "There are many Saudi men and women who studied at the best universities in the world and graduated with honours. These outstanding students were honored by their universities but when they came back to their country they were shocked to find out that there were no jobs awaiting them. "If at all there were job opportunities for them, they would not be in their fields of specialisation. This has pained and disappointed the graduates who were honoured and accredited abroad but not in their own home. "Even the employees who were sent for higher education abroad by their government departments were not given the opportunity to improve the performance of these departments. They were ultimately made part of the routine and bureaucracy existing in these departments." What happens to the detainees? Until now, very little information has emerged about what happens to migrants once they have been detained, or how they are being treated. An article in today's Arab News sheds some light on the process, if not the conditions in which detainees are held. It quotes Badar bin Saud Al Saud of the Makkah police directorate as saying the first step is to check whether the migrants have any criminal cases pending. "If they are cleared, their personal belongings are deposited in a special box at the Passport Department's reception centre. Their biometrics are recorded in the same building and all details recorded before they are sent to the detention center at the general service centre with the knowledge of the Prisons Administration. "He said the next step involves getting travel documents for the detainees from their consulates and placing them on flights to their home countries. The entire process takes about 48 hours depending on the consulates and flight availability. The Saudi government pays for their flights home, he said." The paper also quotes a Jeddah police spokesman as saying the city's detention centre has been refurbished and has "unlimited capacity" for detainees of both sexes. "The detention facility has an unlimited capacity and is guarded by security on all sides. Medical, civil defence, first aid, utilities and humanitarian services are available around the clock." Rafeeq Qasim, 28, is from Mahwit [in Yemen] and has been working in Saudi Arabia since 2006 ... Qasim's work in Saudi Arabia is the only source of income for his 13-member family. "I know hundreds of Yemenis who have sold everything they have, even their cell phones, as they prepare for their return to Yemen. The situation is very bad here," Qasim told the Yemen Times. "Saudi authorities have arrested about 500 Yemenis in the past two months for sending home remittances that exceed the monthly salaries stipulated by their employers. "Yemenis have resorted to sending money back physically with those traveling to Yemen." investigate alleged abuses committed against Filipinos during Saudi Arabia's crackdown on undocumented workers. Thirty expelled Filipinos arrived in Manila on Monday complaining of ill-treatment by Saudi officials, including "being treated like animals" and having their feet chained. "Nothing short of a diplomatic action from our government must be taken to seek an apology from the Saudi government for such barbaric and dehumanising actions and prevent its recurrence," Walden Bello, head of parliament's committee on overseas workers' affairs, said. He also also accused to Philippines government of failing to prepare "the necessary resources" to help its citizens in Saudi Arabia even though it knew the crackdown was coming. Blog post 8 November 2013: Dressed in a spotless white thobe, Madinah's municipality chief picked up a brush yesterday to assist other Saudi officials in sweeping the streets around the Prophet's Mosque. This unprecedented but largely symbolic move came when the regular street cleaners stopped work in protest at the arrest of some of their colleagues as part of the kingdom's crackdown on "illegal" migrant workers. The Saudi Gazette says the cleaners have now been issued with "special IDs" to avoid further arrests but it appears that some over-zealous inspectors may be rounding up foreigners on the mere suspicion of working illegally – contrary to the assurances given by officials when the crackdown began. In Makkah, a police spokesman appeared to admit that random arrests were taking place when he said the campaign in the city was focusing "on main squares and public places" and well as places that had previously been identified by investigators. Some members of the public have also joined in, raising fears of community-based violence directed at migrants. Yesterday Tawakkol Karman, Yemen's Nobel Peace Prize laureate, posted a photo on her Facebook page (below) which is said to show a Saudi man attempting to detain a Yemeni expatriate while waiting for police to arrive. Meanwhile, a police spokesman in Riyadh said the public could help by reporting suspected "violators" but warned citizens "against putting themselves in danger by participating in arrests" since they are "not qualified and have not been given the jurisdiction to act in that capacity". no random raids. "Secret teams will monitor the location prior to carrying out inspection by the concerned agencies," he said. Abdullah Abuthnain, Deputy Minister of Labour, also said inspections would be "based on decent and civilised behaviour". He told a news conference: "The inspectors have been directed to perform their mission in a professional way and not to do anything that might hurt the feelings of workers and their employers or damage the reputation of institutions." On Wednesday, an Ethiopian migrant was shot dead by security forces in Riyadh when he reportedly tried to grab a policeman's weapon during a raid. as much as 30%. Recruiting new workers to fill the vacancies is a long and complicated business because of the kingdom's labour laws. Small construction firms have been especially hard-hit and 40% of them have now stopped operating, according to Khalaf al-Otaibi, president of the World Federation of Trade, Industry and Economics in the Middle East. Otaibi also pointed out that small and medium-sized firms account for about 75% of Saudi Arabia's construction industry. About 300,000 Sudanese living in Saudi Arabia are facing deportation, according to reports from Khartoum. The Sudanese government says it has no intention of helping them because it is too busy dealing with its own economic problems. Offering them government jobs has also been ruled out because they are mostly low-skilled workers. They were married in Jeddah, though not legally since Yussira is an illegal resident and marriage is not solemnised in the kingdom without completing legal formalities. The couple settled down with three children until the crackdown shattered their family haven. They decided to move to Pakistan, but neither had legal documentation. Sikandar told Arab News: "My family and I were literally in tears at the Pakistani Consulate when two young diplomats spotted us and enquired about our case. "It is extremely difficult to obtain exit visas for Indonesian citizens and there would have been no way for our children's documents to be processed, but one of the vice consuls pursued the case at the deportation centre and completed our procedures. "He helped me obtain a visa for my Indonesian wife. I was broke since I'd lost my job, but the Pakistan Consulate helped to provide tickets for my family." When the migrant workers have gone – what then? Blog post 9 November 2013: Thousands of expatriate taxi drivers in Jeddah have stopped work as result of Saudi Arabia's crackdown on migrant labour. Many have already left the kingdom – never to return – but most are thought to be in hiding for fear of arrest and deportation. One company manager, Abdullah al-Shehri, told Arab News about 40% of taxi firms in the city have been affected, with some operating a reduced service while others have closed completely. "More than 150 companies that relied mostly on drivers who were not able to rectify their status during the grace period have lost more than 70% of their income," Shehri said. In the holy city of Makkah yesterday, 6,000 street cleaners and garbage collectors – mostly Bangladeshis – ended a five-day strike triggered largely by the non-renewal of their residence permits. They were also complaining about abysmal wages and accommodation that lacked basic facilities. Arab News says the company employing them had slipped into the Ministry of Labour's "red category" – meaning that the iqama (residence permit) of expatriate workers cannot be renewed. The Arab News report does not explain how the striking cleaners were persuaded to return to work, though possibly some kind of arrangement was worked out in relation to their permits. There have been numerous examples of knock-on effects caused by the crackdown which I have noted in previous blog posts over the last few days. The construction industry is one sector of the economy that has been badly hit, with many sites coming to a halt. In some cases this has resulted in holes in the road with no one to complete the work and fill them in. "Beggars are now glad that they can position themselves right next to the steps leading to the mosques in the absence of vendors. "A group of female beggars from Chad told Arab News: ‘We are happy and relaxed to find space inside the mosque yard'." Migrants who have gone into hiding after failing to regularise their residence or employment status seem to be calculating that the raids by inspectors will eventually fizzle out, allowing them to resurface once the heat is off. This might be a reasonable assumption, given the way the Saudi system usually operates. But so far the authorities seem determined not to succumb to "raid fatigue". It's worth recalling that the government first tried to implement the new labour law and the result was chaos. The king called a temporary halt which lasted seven months and allowed more time for planning the implementation. The resumed crackdown is a huge operation involving a lot of cooperation among various ministries and branches of government. It may even succeed in its primary objective of ending (or at least greatly reducing) irregularities in the employment system that have been allowed to develop through negligence and corruption over many years. But looking beyond the immediate effects in terms of economic disruption and the suffering caused to migrants and their families there's still the question of who will fill all the job vacancies created by the crackdown. There's no sign that the Saudi authorities have given much serious thought to this. Their hope is that migrants who leave will be replaced by unemployed Saudis but that is unrealistic because of a serious mis-match between the vacancies created and the skills and expectations of most Saudis. "Saudisation" of the workforce has been government policy for years though it has met with little success (and a lot of resistance from employers). More recently the Arab Spring uprisings have given Saudisation a new impetus – the theory being that young Saudis are less likely to rebel against the regime if jobs can be provided for them. However, cracking down on migrant workers won't solve that. It's really not a question of migrants depriving Saudis of jobs but, rather, a question of Saudis' own employability. A large part of the problem is an education system designed to please religious conservatives – churning out vast numbers of Saudis with unusable degrees in Shariah law, etc, and not enough with knowledge and skills that prepare them for the workplace. I will look in more detail at the problems of Saudisation in a future blog post. Blog post 10 November 2013: Two people died in Riyadh on Saturday in fights involving foreign migrants, Saudi citizens and police. The rioting, in the Manfouhah district of the capital – a poor neighbourhood where many East Africans live – was the worst outbreak of violence since the Saudi authorities launched their "all-out" campaign to round up "illegal" workers and expel them from the kingdom. On Tuesday an Ethiopian man was shot dead by police in the same district, reportedly while resisting arrest. The two who died on Saturday night are said to be a Saudi man who was hit by a stone and a man of African origin who was shot by police. AFP says a further 68 people were injured (28 Saudis and 40 foreigners) and 561 people were arrested. An Ethiopian official told AFP that trouble broke out when Saudi police attempted to round up Ethiopians who had failed to regularise their status in the kingdom and move them to a camp which had been specially set up in the area, to await deportation. "Armed with knives, the rioters gathered in the district's narrow streets early evening Saturday, threatening policemen, motorists, and pedestrians, witnesses and police said. "A large security force cordoned off the central Riyadh district and closed its entry and exit points, arresting a number of the violent illegal workers and calling on the rest of them to turn themselves in, according to Brigadier General, Naser al-Qahtani, media spokesman for Riyadh Police." The Riyadh Connect website has a collection of photos and videos from the scene. Twitter user Mona Kareem has also been posting links to photos and videos. The crackdown on migrants, which has so far been largely ignored by western media, is rapidly turning into a full-blown and self-inflicted crisis. The authorities have clearly spent a lot of time planning for the mass arrests and deportations but seem to have given almost no thought to the knock-on effects. Countless businesses have had to close as migrant workers leave the kingdom or go into hiding. The latest problem highlighted by the Saudi Gazette is a sewage crisis in Jeddah caused by a lack of truck drivers to empty septic tanks. Saudi drivers refuse to do that kind of work and foreign drivers are fearful of arrest. This is not necessarily because the foreigners are illegal residents but because their work permits are very specific and restrictive. Previously, many of the drivers were subcontracted – which now technically puts them on the wrong side of the law. One African driver told the Saudi Gazette he had not worked for three days as the profession shown on his documents is that of a private driver, which means he is unable to apply for a public transport licence. One predictable consequence of the crackdown on migrants is rising prices. Labour shortages are pushing up wages and the price of some food items had reportedly doubled during the last few days due to closed markets and disruption of supplies. Arab News quotes "experts and residents" calling for a new crackdown – this time against businesses which are allegedly using the shortage of expatriate workers "as an excuse to raise prices". Another troubling aspect of the campaign against migrants is its possible effect on race relations. Although the last six days have given Saudis a very visible demonstration of how much they depend on foreigners, racism is never far below the surface. Expatriate workers from the world's poorer countries tend to be viewed as inferior, while some Saudis also resent having expatriate bosses. The nitaqat ("Saudisation") programme, which was introduced by the ministry [of labour] to encourage companies to employ Saudis, has been exploited by many companies who claim Saudis are not committed to work ethics ... In many cases, companies agree to employ Saudis on paper as a means to increase their Saudisation quotas. Jamaan Aseeri worked at a company as a private guard, headed by an expatriate manager who constantly harassed him. "I was looking after the women's section in the company and the manager constantly entered the area at will and told me that my job was useless," he said while adding that he was forced to resign after he was unable to put up with the abuse. Fahad Wafi worked in the human resources department of a company, which was headed by an expatriate. He claimed that his manager berated Saudi employees, refused to assign them work and asked that they stay at home and collect their salaries. "We complained to the company's executive manager who was also an expatriate but he didn't do anything so we finally resigned and filed a complaint at the labour office," he said. There is some evidence of Saudi citizens taking matters into their own hands to assist the round-up of "illegal" migrants. Two days ago I posted a photo which appeared to show a Saudi man performing a citizen's arrest on a Yemeni migrant. 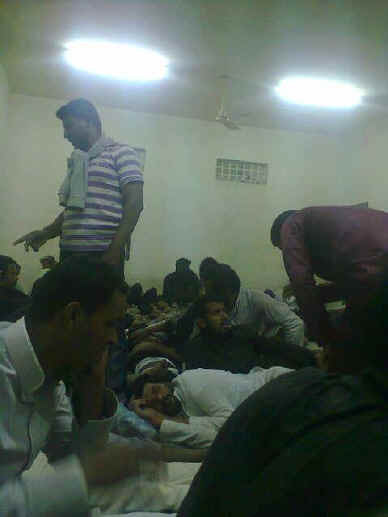 There are also claims that private citizens took part in some of the arrests in Manfouhah on Saturday night. More details have emerged in connection with a video that I posted on Thursday showing hundreds of Yemenis fleeing from a detention centre at al-Tuwal on the kingdom's southern border. It seems they were attempting to sneak across the border into Yemen without being fingerprinted. Once fingerprinted and issued with a "final exit visa", migrant workers are not allowed to return. The Yemenis hoped that by returning to Yemen without being fingerprinted they would be able to return to Saudi Arabia – and resume work there – at a later date. Okaz/Saudi Gazette contacted the Ministry of Education's spokesman, Mohammad Al-Dekhaini, to inquire about the steps the ministry has taken to solve the problem but he refused to comment on the issue. A number of schools said they had anticipated the problem and had communicated their concerns to the authorities but no action was taken. Sources in the Ministry of Education have said the ministry is planning to sign a contract with a specialised cleaning company to resolve the problem of uncollected garbage. Meanwhile Arab News says teachers at Qur'an memorisation schools have been "left in a limbo" because almost all the teachers at these schools (mainly from India and Pakistan) are "working contrary to the profession stated in their work and residency permits". Last week the Labour Minister said such schools would not be targeted but it is still unclear how the problem will be resolved. Arab News says there are only a handful of teachers whose information on iqamas (permits) matches their profession. Blog post 11 November 2013: Following an eight-day fact-finding visit to Qatar a UN investigator has called for an end to the restrictive sponsorship system for employing expatriate workers. François Crépeau, the UN’s special rapporteur on migrants’ rights, said Qatar should make it easier for migrants to change employers without the consent of their existing sponsor/employer and should also abolish the exit visa requirement “which leads to a large number of migrants being stranded in Qatar for no apparent reason”. Ultimately, he said, Qatar should abolish the kafala (sponsorship) system and replace it by “a regulated open labour market, where the work permit allows the worker to change employer”. Qatar has the highest proportion of migrant workers in the world. About 88% of the country’s population are foreigners – mostly employed in construction, service industries and domestic work. Qatar’s treatment of migrant workers has come under increased scrutiny – and criticism – recently because of construction work ahead of the 2022 World Cup. In September, an investigation by the Guardian found that Nepalese workers, who make up the single largest group of labourers in Qatar, “face exploitation and abuses that amount to modern-day slavery”. Crépeau, a Canadian, will formally report to the UN Human Rights Council next year but before leaving Qatar he presented a long list of “preliminary” recommendations (published here by al-Jazeera). The fact the al-Jazeera has reported Crépeau’s criticisms in detail (while also highlighting his more favourable comments) suggests the Qatari authorities are willing to consider his recommendations and perhaps go some way towards meeting them. Although Crépeau’s investigation was confined to Qatar many of his recommendations could be applied to other Gulf states too – including the thorny question of exit permits. These are intended to prevent expatriate workers from leaving the country with unpaid debts but they can also lead to people becoming trapped there with no means of support. Business interests in Qatar have been resisting a change in the rules, claiming they could suffer financially. Crépeau suggests scrapping the permits but allowing creditors to apply to the courts for a travel ban on individuals who owe them money. Blog post 12 November 2013: The Saudi authorities arrested a total of 33,353 “illegal expatriates” and deported 14,304 during the first week of the crackdown against migrants which began on November 4, according to the General Directorate of Prisons. In Riyadh, some 17,000 “illegal Ethiopians” have surrendered following the riot on Saturday in which two people died, police spokesman Nasser al-Qahtani said. The number arrested in connection with the riot has now risen to 1,199 – including 119 women and 11 children. In Makkah, about 500 “African illegals” were rounded up on Monday. They had gathered under a bridge with their families and were blocking roads – apparently in protest at delays in their repatriation after failing to regularise their status in the kingdom. There have been similar incidents elsewhere. On Saturday, about 300 Afghans gathered outside their consulate in Jeddah, protesting at delays in completing their deportation arrangements. Arab News says police took them to a detention centre by bus and were trying to “expedite travel procedures”. On Sunday, hundreds of stranded Filipinos, including women and children, assembled in Makkah, causing traffic jams. They too were reportedly demanding repatriation. Some 600 of them were taken to a detention centre, though others were left behind. The Saudi Gazette and Arab News both report a street brawl in Jeddah overnight on Sunday/Monday involving two groups of migrants – Chadians and Ethiopians – which resulted in 57 arrests. It is unclear if this is connected with the deportation campaign. A police officer and four Ethiopians were killed in Jeddah on Sunday when a car taking the migrants to a detention centre overturned. In the south of the kingdom, a spokesman for the Jazan border guard said 20,000 “residency rule violators of Yemeni descent” have been arrested and deported to Yemen since the raids began. According to the border guard, additional officers have been sent to assist “in processing the large number of illegal expatriates who have been arrested since November 3”. If the border guards’ figure of 20,000 Yemeni deportations is correct, the nationwide figure of 14,000 deportations given by the General Directorate of Prisons must be wrong (and vice versa). Either way, the scale of the current upheaval in Saudi Arabia is extraordinary though it continues to get scant international coverage. As far as I can tell, the Now York Times, for instance, has published only one report so far. Referring to the migrants simply as “illegals” ensures that they get little or no public sympathy, though the reality is more complex. For many, the restrictive nature of Saudi employment rules makes it very difficult to comply with the law. The Saudi authorities have clearly demonstrated their ability to arrest and detain people en masse but their competence in all other areas is a matter for doubt. The campaign to end “illegal” working by foreigners is ham-fisted and ill-conceived. Mass arrests of expatriates do not address the underlying problems of the sponsorship system for employment or the failings of the “Saudisation” programme which is intended to generate jobs for Saudi citizens. So far, the main effect of the crackdown has been to damage the economy by creating labour shortages – vacancies mainly in jobs that Saudis are unable or unwilling to fill. “Al-Eqail believed that the reluctance of Saudis to join the contracting sector is due to the harsh conditions in which they would they have to work. In the domestic employment sector, Arab News reports that the government is now considering recruitment of Turkish housemaids to replace those from Indonesia, Ethiopia, India and other countries. “Families in Saudi Arabia have refused to put up with housemaids who ran away or only worked for the three-month trial period. Saudi media are pushing the idea that the crackdown on migrants is good news for unemployed Saudis. The Saudi Gazette says that by last month it had already created 150,000 “job opportunities for young Saudi men and women” in the private sector – though these seem to be recorded vacancies rather than jobs that have actually been filled by Saudis. Meanwhile, the Labour Ministry is “preparing” to Saudise 250,000 jobs in retail stores “within the next few years”. About 80% of these shops have previously been run by foreigners, Arab News says. Such schemes, however, do not address the immediate problem of labour shortages caused by the crackdown and, and time goes on, unemployment of Saudis likely to get worse rather than better. This is not merely a Saudi problem: it affects all the Arab Gulf states. In a tweet this morning, Simeon Kerr of the Financial Times says GCC countries are expected to create 600,000 private sector jobs by 2018 but 1.6 million nationals will also enter the labour market – leaving a gap of one million which cannot be met by jobs in the public sector. Reports today say that seven Saudi teachers who were dismissed by the British International School in Jeddah are to be reinstated following pressure from the Labour Ministry. Readers who have more information about this please send me an email or post a comment in the discussion thread below. A satirical song about the Saudi crackdown on migrants has become a hit on YouTube. “Ja Jawazat” – depicting Asians without passports – has been viewed more than a million times since it was posted in June. Blog post 14 November 2013: Saudi Arabia’s ill-conceived crackdown on migrants continues to take its toll, and one of the latest victims is the kingdom’s harvest. Arab News reports “an acute shortage” of farm labourers at a critical time for the crops. The labourers of course are – or rather, were – mostly foreigners. Imports of fresh produce from other countries have also dropped as a result of the labour shortage, causing a rise in food prices. dropped by as much as 25%. Saudi property agent Ali al-Nasseri said the average rent for each expatriate worker was SR1,000 ($267) a year, which has now come down to less than SR750. Yesterday, police in Makkah said they have detained 4,060 “illegal workers” since the crackdown began on November 4. Nationwide, the total runs into tens of thousands and the largest group affected seem to be Yemenis – 20,000 of whom have reportedly been expelled. On Tuesday, 11 Yemenis died in a road accident, along with a Saudi, as they were being driven towards the border. sent back to their typhoon-hit country. Whether as a coincidence or an attempt to head off criticism of this, Saudi Arabia yesterday presented the Philippines ambassador with a $100,000 cheque towards disaster relief. “Many women come by taxis in the morning and stay throughout the day before returning home in the evening. Some, however, stay put in the night in the hope they will be arrested. “With so many fresh arrivals, officials are clueless about the actual number of violators. It appears they have given up any hope of staying in the kingdom and now want to be sent home as quickly as possible. Mahmood Abu-Ahmed, a Saudi businessman, is firm on his decision of letting go of his Ethiopian maid, saying that the crime during the clashes pressed him to do so. Such is the animosity that the Ethiopian ambassador had to issue a statement denying claims that housemaids from his country are actually witches. Most Ethiopians are either Muslims or Christians and their beliefs prevent them from practising sorcery, he said. Blog post, 19 November 2012: Sometime in the future, when historians come to analyse the fall of the Saudi monarchy, the “regularisation” programme of 2013 is likely be seen as one of its causes. “Regularisation” (a euphemism for expelling migrant workers in their tens of thousands) was meant to end the practice of illegally employing foreigners – a practice which had been allowed to develop over several decades and, more significantly, had turned into a mainstay of the Saudi economy. The idea that this could be reversed almost at a stroke and without major consequences was fanciful at best, but the Saudi government pressed ahead regardless. Millions of expatriate workers were told to regularise their status in the kingdom or face arrest and deportation. While the ensuing crackdown on migrants might be viewed simply as an example of ham-fisted government, its ramifications are more far-reaching. Ultimately, the survival of the House of Saudi (as with other Gulf monarchies) hinges on its ability to deliver comprehensive reform, and the “regularisation” programme demonstrates that it is incapable of doing so. As the problems caused by “regularisation” become more apparent, the authorities are trying to manage them in ever-more-bizarre ways, often by announcing policies that tackle the symptoms while compounding the problems. These attempts to micro-manage the employment system are also becoming more and more discriminatory. At a time when many countries are trying to remove discrimination from the workplace, Saudi Arabia is moving in the opposite direction. More and more, race and gender rather than ability are becoming the main criteria for employment. “Many immigrant workers have fallen foul of Saudi laws less by intent than because of the unfairness of the visa-sponsorship system that the kingdom, along with states such as Qatar, continues to impose. This requires every immigrant to have a Saudi kafeel, or sponsor, who usually demands an annual fee in exchange for providing legal cover. “All too often, kafeels ‘employ’ their charges in fictitious companies, when in fact they seek work on the open market, in breach of rules that restrict foreign workers to the job described in their visa. Two weeks after the crackdown on migrants began in earnest the short-term effects are obvious, not to mention entirely predictable. Labour shortages have closed many businesses while others are unable to work at full capacity. Supplies of fresh food have been hit, driving prices up, and rubbish has gathered uncollected in some of the streets. (I have been documenting the effects here in more detail.) In the meantime, and just as predictably, unemployed Saudis have not exactly been rushing to fill the sudden vacancies left by migrants. Some of this chaos may be short-lived. In many cases migrants who may be entitled to legal status in the kingdom have absented themselves from work in order to avoid arrest while their paperwork is being processed. In Makkah, 7,000 street cleaners went on strike “due to a failure on the part of their employer to renew their residency permits but officials have devised a race-based solution to that. In future, cleaners will be hired from more than one country – on the grounds that this will make them less able to organise a strike. In other areas of the economy, though, the effects look set to continue for some time. Arab News reports that construction firms (which depend very heavily on foreign labour) are not bidding for new contracts – fearing they may not have enough workers to complete the projects. One of the main reasons for the mass expulsion of migrants is to assist “Saudisation” (replacing foreign workers with Saudi nationals) – a policy the government has been pursuing for some years without much success. Despite substantial resistance from employers, Saudisation has been given new impetus by the Arab uprisings. If jobs can be found for the growing numbers of unemployed young Saudis, so the theory goes, they will be less likely to rebel. But the trouble with linking “regularisation” to Saudisation is that the jobs vacated by foreigners are often not the type of jobs that Saudis are willing to do. Many are dirty or menial jobs that Saudis tend to regard as beneath them. At the other end of the social scale, the education system still produces a surfeit of graduates in religious studies and not enough with qualifications that prepare them for employment. Rather belatedly, there seems to be a media campaign aimed at changing attitudes. A few days ago, Okaz and the Saudi Gazette reported on young Saudis who are “proud” to work in Qatif’s wholesale fish market. Apparently the youngsters are so happy in this work that they ignore “the derogatory comments they receive from others who spend their time wandering in the streets and sitting on pavements”. Another employer, who runs several clothing stores, said of his Saudi workers: “They start with missing work for a day or two and arriving late until they decide not to come at all." The Labour Ministry’s response to this is a plan that will force shops to close by 9pm (despite the popularity of late-night shopping in most of the Gulf states). The early closure of shops, we are assured, “will help attract Saudi youths to open and run retail outlets”. The Saudi Gazette also reports that guards working for private security firms “have been denied the benefits of the Saudisation programme”. Besides proposals to raise (and subsidise) their salaries, a “scientific study” has recommended that the guards be referred as “security men” to “give them self-confidence”. Another suggestion (for reasons that are not explained) is that those working in this sector should be “the children of Saudi women married to non-Saudi men”. Under the general heading of Saudisation there’s also a programme known as “feminisation” – another euphemism, which basically means gender segregation. For several years now, shops selling women’s underwear and accessories have been compelled to employ only female staff, and men are not allowed to enter unless in a family group. This has proved difficult to implement and during the last year the Labour Ministry has forcibly closed more than 500 shops that were found to be “violating” the regulations. all jobs suitable for women in the coming three years”. Although this policy does create job opportunities for Saudi women, in all other respects it cannot be described as a sign of progress or reform. It reinforces the idea women need a different type of work from men, and it further entrenches the archaic principle of gender segregation which the more progressive-minded Saudis are fighting against. Viewed in totality, “regularisation”, “Saudisation” and “feminisation” are all signs of a government that is floundering in a mire of its own creation, that has nothing to offer but authoritarian solutions, that is trying to micro-manage its labour market in ways that are alienating swathes of the business community – and all without any apparent grasp of the need for more fundamental change. Blog post, 26 November 2013: Saudi Arabia's crackdown on migrant workers continues to stir up racist sentiment, and the latest example is a column in Arab News headed "Say no to expats calling for Saudi citizenship". The writer, Abdulrahman al-Zuhayyan, trots out a familiar collection of xenophobic prejudices: foreigners in Saudi Arabia don't speak proper Arabic, they don't mix with Saudis, they take jobs away from Saudis, they only want citizenship for the financial benefits, etc, etc. For these reasons, Zuhayyan says, "it would be a grave mistake to grant foreigners Saudi citizenship on any basis". Fortunately, many of the paper's readers seem to have recognised this as offensive nonsense. The discussion thread below the article contains more than 200 comments – and they are overwhelmingly critical. Before the rules were changed earlier this year, non-Saudi husbands and their children could not legally live in the kingdom without being sponsored by an employer. In February, however, the authorities announced that Saudi wives could now also act as "sponsor" for their husband and children. That was a modest improvement but it's still a long way from actual citizenship. Do the arithmetic and you'll see that it's impossible to accrue the necessary seven points unless the mother has a Saudi grandfather. There has recently been talk of dropping the grandfather requirement but no decision appears to have been made yet. "I am unable to comprehend why we, Arabs in general and Saudis in particular, tend to be too strict and too inflexible when it comes to granting nationality," Faiz Saleh Mohammed Jamal wrote in an article for Okaz last February. "Is it due to our feeling of superiority over others? Or is it because we feel that our country is a target for all those looking for quick wealth?" I also know a girl whose father was a foreigner and mother a Saudi. Her brothers were given the nationality but she was not because she was unable to score the required points that would qualify her for the nationality since her father died before her application for the nationality was made ... "
Blog post, 28 November 2013: Saudi Arabia has deported 71,118 “illegal” foreigners since its crackdown on migrant workers began on November 4, according to latest figures from the kingdom’s Passport Directorate. This total is likely to continue increasing because of delays in processing deportations since many of the arrested migrants do not have identity documents. Before carrying out deportations the authorities are also checking criminal records and taking biometric details in case the migrants attempt to return. Arab News reports that almost 300,000 Egyptians have returned home since the beginning of July and the number of Egyptians in the kingdom has now fallen below one million. Remittances by Egyptian workers so far this year total only 1 billion Saudi riyals ($267m) – a huge drop from 6 billion riyals in 2010. In Yemen, officials are expecting the total of Yemeni returnees from Saudi Arabia to reach 210,000. Some 130,000 returned during the initial crackdown last March (and the subsequent “grace” period), with a further 80,000 expected during the current crackdown. an article for Christian Science Monitor. In a move to support the returnees financially, the Yemeni authorities are deducting one day’s pay from all government employees – a move that is causing some controversy in Yemen. Two groups reportedly exempted from deportation are Palestinians and Burmese citizens. Arab News says they will not be sent home, even if they are found to be violating the new labour law, “due to internal strife in their countries”. However, it is unclear what will happen to them. Meanwhile, the campaign to round up “illegal” workers in Saudi Arabia appears to be losing steam – at least in some places. Street vendors in Jeddah, who went into hiding when the crackdown began on November 4, have now returned in force and are “moving freely in the markets of the historical area selling fruit and vegetables at cheap prices”, according to the Saudi Gazette. “The central region of Qassim in particular, a province that houses a significant number of visa violators, is witnessing intensified labour raid campaigns, where thousands have been arrested. “Villages, including small hamlets, have been subject to police inspection. “Arab News spoke with numerous residents in Buraidah, who said that inspections are being carried out on the region’s roads and also in major market areas in the city. The crackdown also caused many shops to close – probably permanently – and some Saudis are now complaining about losing possessions. The Saudi Gazette reports on a man who left a computer for repair and is unable to retrieve it, and a women whose dresses are in a shut-down clothing shop. In Makkah, expatriate hospital cleaners went on strike for the second time in a fortnight, claiming that the company which employs them has reneged on an agreement to increase their wages from 400 riyals ($107) to 700 riyals. This highlights one of the major problems with the kingdom’s sponsorship system for foreign workers. Previously, the cleaners were able to supplement their pitiful salaries by doing unofficial part-time work. As a result of crackdown they are no longer able to do that – hence the demand for a large pay increase. Saudi officials continue to make upbeat announcements about the kingdom’s “Saudisation” and “feminisation” campaigns. Creating more jobs for Saudis, and especially female Saudis, is one of the objectives behind the mass expulsion of foreigners. Matching Saudis to the available jobs, however, is far from easy. Teaching is one of the most sought-after jobs for Saudi women but the director of the kingdom’s Human Resources Development Fund has warned that private and government-run schools are “not in a position to absorb” them in the numbers that would be required. Teaching is one of the few socially-acceptable professions for Saudi women and – unlike many other jobs – the working hours suit mothers with families. Efforts to “Saudise” and “feminise” the jewellery trade have also run into difficulties. According to Abdulghani al-Muhanna, chairman of the gold and jewellery committee in the Eastern Province, most jewellers’ shops are small – less than 40 square metres – which means it is almost impossible to divide them and comply with the gender segregation rules if they are to employ women. About 70% of the kingdom’s gold jewellery factories are thought to be tasatur businesses controlled by foreigners in exchange for a fee paid to a registered Saudi owner. Most if not all of these are expected to close as a result of the crackdown and Saudisation. Blog post, 1 December 2013: For the last month or so, as regular readers will know, I have been following the story of Saudi Arabia's crackdown on migrants. I have spent hours gathering information from open sources in an effort to get a clear picture of what is happening – and this is my fourteenth blog post on the subject in the space of four weeks. To some this might seem excessive or even obsessive but it's an important story that international media – and especially western media – have largely failed to notice. It's a story that deeply affects the lives of hundreds of thousands of people, mostly from the world's poorer countries, who have been living and working in the kingdom – as well as countless relatives back home who have been depending on their remittances. It's a story that heralds fundamental social and economic changes in Saudi Arabia itself, possibly leading to political changes too. It's a story that also affects other Arab Gulf states, since they have all become heavily dependent on foreign labour – basically relying on those they regard as inferior beings to do dirty, menial or dangerous tasks from constructing their buildings, driving their cars, cooking their meals, cleaning up their mess and preparing their dead for burial. Many of these people work in conditions that amount to modern-day slavery. It's a story too about racism in a kingdom that presents itself to the world as a model of Islamic rectitude, and it's a story that feeds into debates about immigration in other parts of the world. If you want to know what racists really mean when they say "Send them home! ", look no further than Saudi Arabia. While writing about this on my blog, I have been puzzling over the apparent lack of interest elsewhere. Media in the Philippines, India, Pakistan and Yemen – some of the countries most affected – have certainly been covering it but apart from a few news agency reports coverage in the west has been scant. Finally, on Friday, we had the first substantial report from a western journalist on the ground in Riyadh – from Ian Black, my former colleague at the Guardian. Meanwhile the BBC, judging by its website, has touched on the story three times (in English) since the crackdown began – once on the first day with a short news agency report, again on November 10 after violence broke out in Riyadh, and again on Friday with a more substantial report by Ahmed Maher of the BBC Arabic service. The American media has been even more negligent in its coverage. The Washington Post and New York Times have had just one story each, in both cases focusing on the violence in Riyadh during the weekend of November 9-10: "Two killed as Saudi police clash with foreigners in Riyadh" (Washington Post, via Bloomberg) and "After Clashes With Saudis, Laborers Opt to Go Home" (New York Times). With regard to Tunisia, the US government was in much the same position as the media. It wasn't until the fourth week of the Arab Spring that the State Department uttered its first words on the subject ("watching ... with a great deal of interest") – and that was only in response to a question from a BBC journalist at a press conference to publicise Hilary Clinton's impending "friendship" tour of Gulf autocrats. The initially sparse media coverage of the Tunisian uprising generated several popular conspiracy theories at the time. Some suggested that editors around the world were protecting Ben Ali from adverse publicity for political reasons. Others contrasted the thin coverage of the uprising in Tunisia with the blanket coverage of protests in Iran following the disputed presidential election of 2009. The Iranian regime was a foe, while the Tunisian regime was a friend. QED. The real reasons (there's almost always more than one) were actually more complicated and mundane, as former CNN reporter Octavia Nasr demonstrated in connection with Tunisia and Iran. It's also hard to see political considerations as the determining factor in coverage of the migrant expulsions in Saudi Arabia now. Given the recent deterioration in US-Saudi relations, if it were simply about politics American media would surely be raring to have a go. Levels of access for journalists and availability of video footage (in the case of TV) are often more important factors in determining the amount of coverage a story gets. In Saudi Arabia's case, foreign journalists can't simply hop on the next plane and start reporting there. They need visas – and that can take time, even if the Saudi authorities decide to grant them (which is by no means a foregone conclusion). Apart from that, though, I think there are a few other factors at work too. One is that editors often have rather fixed views of what constitutes news from the Middle East and tend not to recognise stories that don't fit their expectations. In this area, violence and fears about security are familiar themes – so it's probably no coincidence that the Saudi migrants stories in the Washington Post and New York Times were both framed in the context of violence. Within the totality of Middle East coverage there are also familiar and predictable sub-themes relating to specific countries. Hizbullah in Lebanon, Syrian refugees in Jordan and women drivers in Saudi Arabia are some of the current examples. When something new comes along that doesn't fit the usual mould editors can have trouble adjusting their mindset. Another problem with Saudi Arabia's "illegal migrants" story is that it isn't a simple black-and-white tale. "Illegal" in this context covers a multitude of things. Some of the migrants might be considered deliberately illegal because they arrived in the kingdom for a religious pilgrimage but decided to stay on and find work there without attempting to regularise their position. Others, probably the vast majority, are accidentally illegal because of the unfair labour laws. Complexities of this kind are not always welcomed by reporters or their editors and are often difficult to explain to readers in a few short sentences. There is also, I think, a more fundamental problem with international news coverage in the media. Because of the internet, major news organisations increasingly view themselves as global rather than country-specific media, but this change isn't yet reflected in the way they work. In the American media, international coverage is still very insular and US-focused, framed in terms of American domestic politics. When something happens in the Middle East, the first question is invariably how it will affect the US and, if so, what the president should or should not do about it. One example from the last month has been endless debate about Saudi Arabia's decision not to take up its seat at the UN Security Council, and what that means for US foreign policy. Meanwhile, the expulsion of hundreds of thousands of migrants causes only the tiniest of blips on the radar. The migrants, after all, are not Americans. Employers seek to prevent workers "escaping"
Blog post, 2 December 2013: The Saudi Gazette published a disturbing article the other day in which a number of Saudis talked about relations with their foreign servants – and defended what amounts to slavery. The article highlights one of the many iniquities in Saudi Arabia's "sponsorship" system for employing migrant workers: the practice of confiscating worker's identity documents so that they can't "escape". The word "escape" actually appears 20 times in the article in connection with workers leaving their jobs – an interesting reflection on the way many Saudis view their employees and the lack of trust that often exists between them. The paper quotes Suhaila Zain al-Abideen – described as "a human rights activist" – who opposes the idea of letting expatriate workers keep their identity papers"
"Whenever the expat worker has his papers with him, he may not hesitate to escape whenever he has the chance," she said. Al-Abideen also warned that housekeepers might commit a crime inside the household they are working in or steal some items before running away. She said expatriate workers may move freely inside the country or travel to their home countries if they have their identity papers with them. "Many of the house helps come to our country with the sole purpose of stealing and running away," she said. Another rights activist, Aql al-Bahli suggests that confiscating identity documents does not necessarily prevent workers from running away. He points out that many have fled leaving their papers with the employer – which is presumably a measure of how desperate they were to leave. "am one of the expats. i won t run if my former employer treat me well, did not abused me at work. imagine a 3 storey house with 2 young boys ages 5 and 3 to look after one of them is autistic i do all the household chores everyday alone i used to wake up 5am and sleep around to 2am the next day. lack of sleep i eat good meal twice a month i mean meal with rice. everyday my stomach only have coffee in the morning and water the whole day thats the reason why i left my employer." "I myself is tripped by the sponsor who never kept his word even he is not paying our basic salary and he owes me huge amount ..."
"i am a doctor ... my passport is with the sponsor, and my sponsor is MOH [Ministry of Health], if i have to go i will go. y hold my passport, its giving this country a bad name ..."
"I cant remember my employer told me about this. All i know is that, everytime i report to work after vacation i need to surrender my passport so in return i can get my iqama. "If there is any proof needed to show that a type of slavery exists in Saudi Arabia, one only has to read this article. I could not believe what I was reading. Employees 'escaping' , 'runaway status', 'could not travel outside the country without consent of the employer'? Are you people serious? This is language to describe slave and master relationships! I am saving this shocking article." "Forcing the workers to stay with you by holding their passport is treating them as prisoners. The suicide rate of most domestic workers could have been averted if they were free to go. The law is a modern day of slavery. Saudi Arabia, citizens have to change such system. It is a shame to force a person to work as prisoner." "This is perfect example of modern slavery. We Saudis should treat them nicely and, trust me, they are more loyal than our own young generation and trust worthy. SAR 1200 or 1500 ($320-$400) their monthly wages - that's a shame. Will any Saudi work on this wage? Of course not." "If employees are treated well, they will not run away. If you pay them a good wage, and treat them with respect, you will keep them. Employers who treat staff badly, abuse them (Physically or mentally) withhold pay and benefits, or pay paltry wages should not expect their staff to be loyal. The escaping workers are the victims here, not the Saudi sponsors." Last month Saudi Arabia was elected to the UN Human Rights Council. Saudi Arabia: a nation of entrepreneurs? Blog post, 4 February 2013: It’s now three months since Saudi Arabia launched its all-out crackdown on “illegal” foreign workers. I reported on the beginning of this ill-conceived campaign in a series of blog posts last year and it’s time for an update. Saudi statistics are not necessarily reliable but by January 21, according to the interior ministry, 250,000 migrants had been deported since the start of the crackdown on November 4. This is not by any means the whole story, though. There was also a short period of mass expulsions last April before the king called a halt, allowing a “grace period” for migrants who lacked proper documentation to regularise their status or leave the country voluntarily. Even before that, large numbers had been leaving quietly and according to Saudi officials 800,000 were expelled during the previous 15 months. Whatever the overall total, the numbers are still growing. Last Friday night police rounded up 378 “violators of residency and labour regulations” in Dammam, bringing the total so far detained in the Eastern Province to 19,425. Other arrests last week included “700 illegal residents including 12 wanted men and a group of bootleggers” in al-Unooz district of Riyadh and 9,000 “illegal workers” in the Hai al-Wazarah area of the city – mainly Asians from Bangladesh, India, Pakistan and Sri Lanka. “Many of the Filipinos arrived from the central and eastern regions of the kingdom to seek an easy departure but were stranded in Jeddah for being unable to fulfil the criteria for the exit process. Others demanded to be deported from the airport itself resulting in their being detained in Jeddah. praised its facilities and said deportations are “going on at a fast pace now”. It’s unclear how many of the 2.6 million Bangladeshis in the kingdom are being deported but 800,000 are said to have legalised their status with a further 31,000 returning home during the grace period. Bangladeshis mainly work in construction but in 2009 Saudi authorities cut down on the issuing of residency permits. Since then, only 70,575 Bangladeshi workers have managed to obtain jobs in the kingdom. One of the main aims of the crackdown on migrant workers is to create jobs for Saudis, thus reducing unemployment – especially among the potentially disaffected youth. There has been much scepticism about the feasibility of this because most of jobs left behind by expelled migrants are for menial or dirty work – not the sort of vacancies that Saudis would readily apply for. 1. The private sector has employed more Saudis in the past few months than it had in the last 30 years. 2. The employment level of Saudis has gone up by 1.5% since the implementation of the new labour laws in November. 3. “Saudisation” has gone up to more than 30%. Without more details, however, it’s almost impossible to know what these claims actually mean. Nor does everyone share the minister’s optimistic view. Last week several members of the Shura Council (the unelected parliament) complained that the Saudisation (nitaqat) programme has failed to deliver. Despite 12 billion riyals ($3.2 billion) spent on job creation through the Human Resource Development Fund, unemployment has actually risen. “Companies manipulate the system to give the impression that they have helped Saudis get employed,” a Shura member said. One growth area, according to Prince Sultan Bin Salman, head of the Commission for Tourism and Antiquities, is tourism. There will be a fresh boom in tourism during 2014, he said, and this sector will eventually become the kingdom’s largest employer. Several astonished readers of the Arab News report pointed out that if Saudi Arabia really wants to increase tourism it should start issuing tourist visas (which at present are almost impossible to obtain). In the background, there’s also a steady flow of propaganda stories in the local media aimed at turning Saudi Arabia into a nation of entrepreneurs. In Arab News last week, a string of business chiefs handed out advice to young Saudis about broadening their career options. “Expanding the job search has been a dilemma for Saudi youth, as they refuse to take up certain jobs for fear of being looked down upon,” the paper said. One career option that has probably not occurred to many Saudi women is debt collecting, but apparently the prospects are good. According to one firm, women are much more effective than burly men at getting debtors to pay up. There has also been a contest (with $53,000 in prize money) to find two Saudis with “the most inspirational story of entrepreneurship and perseverance in finding a job”. Inculcating a spirit of enterprise is all very well, but what happens when Saudis try to put it into practice? The Saudi system and its bureaucracy seems purpose-made to discourage any sort of initiative. A story in the Saudi Gazette yesterday told how Ibtesam al-Zaqdi set up a female-run café in which has proved such a success that she now plans to open a branch in Interlaken, Switzerland. “Al-Zaqdi claimed that one of the most difficult obstacles she dealt with was getting paperwork done at the labour office. “She submitted her papers and two weeks later found that nothing had been done. Young Saudi entrepreneurs should keep in mind that they may have become elderly entrepreneurs by the time their paperwork arrives. Blog post, 8 February 2014: Hundreds of thousands of foreign workers have been forced to leave Saudi Arabia during the last couple of years, with 250,000 deported during the last three months alone, according to interior ministry figures. One of the main aims behind these expulsions is to provide more jobs for Saudis (even though most Saudis would not dream of applying for the menial sort of work left behind by the vast majority of expelled migrants). The private sector has employed more Saudis in the past few months than it had in the last 30 years. The employment level of Saudis has gone up by 1.5% since the implementation of the new labour laws in November. "Saudisation" has gone up to more than 30%. Despite that, several members of the Shura Council (Saudi Arabia's unelected parliament) have been challenging the official claims. One accused companies of manipulating the system "to give the impression that they have helped Saudis get employed" when in fact they have not. Others pointed out that the Human Resources Development Fund has spent 12 billion riyals ($3.2 billion), supposedly on creating jobs for Saudis, at a time when unemployment has actually risen. "On paper the schools employed over 2,000 Saudi teachers. The schools signed contracts with the teachers, but they were not actually working for them. The average monthly salary the schools paid to these ghost teachers was SR2,000 ($533) while they received SR2,500 ($667) in assistance from the Human Resources Development Fund for each teacher." The paper adds that two government agencies have now started investigations. In an article for Al-Eqtisadiah (reprinted in English by the Saudi Gazette), Abdul Hamid al-Amri questions the labour ministry's claim that the number of Saudis employed in the private sector has increased by 724,000 since the start of 2011. Amri says the ministry inflated this figure by 144,000 – and appears to have done so by continuing to count Saudi workers who were hired but have since died, retired, resigned or been dismissed. This brings the total down to 580,000 extra jobs, but even that figure is too high because it includes "ghost" employees of the kind found in the private schools. Amri estimates that the number of "fake Saudisation" jobs in the period 2011-2013 could be as high as 429,000. "This is just another avenue for abuse of the system. How many companies out there have Saudi employees on the books, and pay Saudis as employees, but the Saudis do not actually work? They sit at home collecting a salary for just having their names down as part of the Saudisation process. This is not Saudisation. This is just another fraud." Blog post, 10 May 2015: In 2013 millions of foreigners living or working in Saudi Arabia were ordered to regularise their legal status or leave the country. Since then, hundreds of thousands have been rounded up and deported. Mass expulsions are still taking place and during the last few months have been averaging around 2,000 a day, according to the Saudi authorities. Since the deportees are almost all migrants from some of the world's poorer countries – especially Yemen and Ethiopia – the story has attracted little attention from western media, though I followed it during 2013 and 2014 in a series of blog posts (compiled here into a single file). Today a report by Human Rights Watch, based on interviews with dozens of workers deported to Yemen and Somalia, documents numerous abuses during the Saudi expulsion campaign. The migrants, it says, "described beatings and detention in poor conditions before they were deported. Many arrived back in their countries destitute, unable to buy food or pay for transportation to their home areas, in some cases because Saudi officials arbitrarily confiscated their personal property." These accounts contrast sharply with the assurances from Saudi officials as the wave of deportations began. A police spokesman in Jeddah, for instance, told Arab News that the city's detention centre had been newly refurbished, with "unlimited capacity" for detainees of both sexes. "Medical, civil defence, first aid, utilities and humanitarian services are available around the clock," he said. In Mecca, police claimed to have a swift and efficient process that "takes about 48 hours depending on the consulates and flight availability". "One man told Human Rights Watch that he visited the wedding hall holding facility ... and saw thousands of foreign workers detained there, men in one area, and women and children in another, both inside and outside the building. "He said that other Ethiopians in the neighbourhood were trying to help the detainees by bringing food and that many at the wedding hall had been left without shelter during a heavy rainfall in Riyadh. One Ethiopian in Riyadh said he escaped from the wedding hall after officials held him in an area outside the building for 10 days. He said the authorities failed to supply the detainees with sufficient food, forcing them to buy food from Saudi guards." "In the first detention centre in Riyadh, there was so little food, we fought over it so the strongest ate the most. 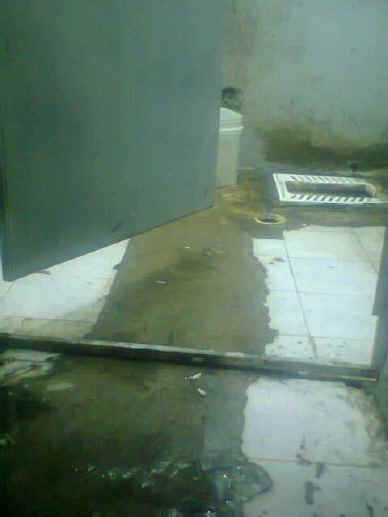 Guards told us to face the wall and then beat our backs with a metal rod ... Then we were transferred to a jail called Shimeisi in Riyadh, there were two toilets for 1,200 people, including dozens of children." "There was no air conditioning, it was very hot. There were five toilets for all of us [just under 790 people]. We slept on the floor. You were lucky if you have a cardboard box to sleep on. There was hardly any space to sleep. We had three meals a day, but it was insufficient [one piece of bread and soup for breakfast, half a plate of rice for lunch, and bread and soup for dinner]. If you had money on you, you could ask the police through the window to help you to buy food. But most people didn’t have money on them as they were picked up in the street. I had $25 but used up $18 in the first seven days." None of the migrants interviewed by HRW had been given an opportunity to legally challenge their deportations, the report says. This conflicts with article 14.6 of the Arab Charter on Human Rights which says "Anyone who is deprived of his liberty by arrest or detention shall be entitled to petition a competent court." Although Saudi Arabia has given refuge to dictators such as Idi Amin of Uganda and ex-president Ben Ali of Tunisia, the kingdom has no established asylum system whereby migrants could apply to prevent their forced return to places where their lives or freedom would be threatened. "Saudi Arabia should immediately halt mass expulsions, ensuring that removals are based on an individual assessment of the circumstances of the person being removed, including any international protection needs," the report says. HRW also calls on the Saudi government to sign and ratify the 1951 Refugee Convention, enact refugee law consistent with international standards, and establish fair asylum procedures for foreign nationals who may be at risk of persecution in their home countries. "In the meantime, it should allow the United Nations High Commissioner for Refugees (UNHCR) to exercise its mandate to determine the refugee status of asylum seekers and facilitate durable solutions for those recognised as refugees, including, where appropriate, integration in Saudi Arabia." Underlying the deportations, of course, is the kingdom's iniquitous employment system which can result in migrant workers becoming "illegal" through no fault of their own, as well as exposing them to exploitation and abuse by employers. Reform or abolish the kafala sponsorship system so that temporary employment-based visas do not tie workers to a specific employer. Ensure that all workers can change employers without losing legal status and without having to obtain their first employer's permission. Abolish the “exit visa” and immediately eliminate the requirement for migrant workers to secure the consent of their sponsors in order to obtain “exit visas” to leave Saudi Arabia. Take concrete steps towards eliminating visa corruption, including by prosecuting those who engage in visa corruption.